Reason 1: salt and alcohol will remove the heavy chunks of build up and leave your pipe smelling like a used bong which is usually not highly convenient for the average person. So why buy bong cleaner? Reason 2: you have the clean up in your sink, toilet, or bath tub of thick tar and resins that you now have to figure out how to clean. Again you start asking yourself, why buy bong cleaner? When you buy bong cleaner that is full of these chemicals, you are not only harming yourself, but you’re also harming the environment. These cleaners are made up of 100% Volatile Organic Chemicals. They are considered hazardous materials and should never be poured down the drain or flushed down the toilet. Local water treatment plants don’t have the capability to clean these materials out of the water supply. Ask yourself, “how upset would you be if your neighbors were pouring 55 gallon drums of acetone down the drain monthly?” So the next time you see one of these videos where they’re pouring hazardous material down the sink without regard for the environment – be sure to thank them. Klear Kryptonite is a clay-based cleaner, it contains less than 3% VOC and doesn’t require you to vigorously shake your precious smoking apparatus to the point you break it. It also contains none of the hazardous material found in the other commercially available or homegrown water pipe or bong cleaning products. 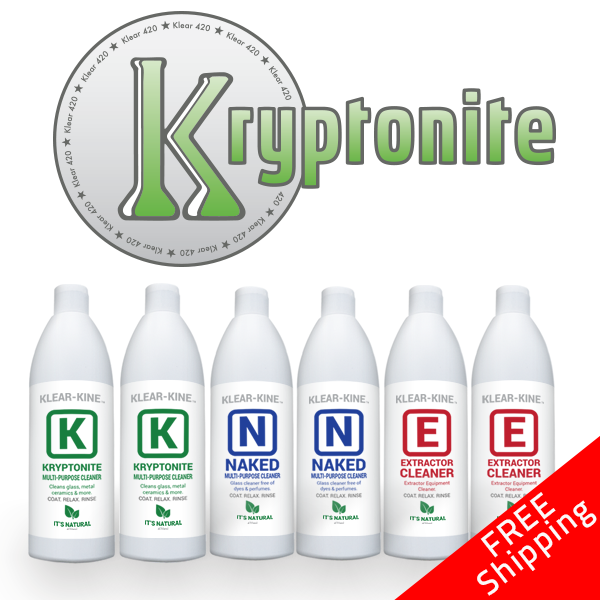 Of course, there are other reasons to buy Kryptonite bong cleaner that extend beyond the environmental impact caused by homemade and other commercially available cleaners. It’s also the only cleaner that will not leave any chemical residue behind for you to smoke off and will leave your water pipe, oil rig, dab rag and sink looking and smelling like it’s brand new. To get a better understanding of how Klear Kryptonite works, take a look at this video, check our Kryptonite on Instagram or head to our Facebook page for real consumers’ before/after photos.